Get £85 off your next order at Leesa with this referral link promo discount voucher code. Leesa proudly present this referral code to all TroopScout users: serving members, ex-forces, family and friends. A pop up message will appear informing you that your promotional discount on a luxury Leesa mattress will be applied automatically at checkout. Close the message. 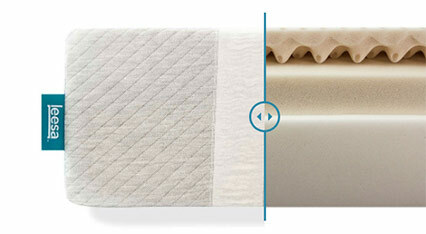 Add your chosen mattress to the cart. Click ‘Cart’ in the top right corner when you have finished shopping. Check that your discount has automatically been applied to the cart. Click ‘Checkout’ underneath to continue. Select whether you’d like to pay by Paypal or credit/debit card. Fill in your shipping address details. Click ‘Continue to shipping method’. Check that your shipping method is free of charge. Click ‘Continue to payment method’. Select your payment method. Fill in the payment details and select your billing address. Click ‘Review order’ for a summary of your order before finishing the purchase. The Leesa mattress is an entirely new way of sleeping. Leesa has redefined the concept of a good night’s sleep by designing a premium pressure relieving memory foam mattress that at its core contours to and supports your body, whilst also regulating airflow to keep you cool. Designed to provide support and incredible comfort, Leesa’s number one priority is getting you quality sleep. A company based in the UK, the Leesa mattresses are manufactured in Derbyshire, near to their UK offices in Manchester. By keeping things simple and dealing exclusively online, Leesa can pass those savings onto you, offering affordable premium quality, free delivery and free returns. At Leesa they understand how important it is to try out a mattress to know whether it’s right for you. So to avoid the awkward experience of sampling a bed in a showroom with a salesperson watching you, Leesa want you to trial your mattress for 100 nights in the comfort of your own bedroom to make sure that you’ve made the right choice. Not only that, Leesa is a Certified B-Corp, a company who take into consideration their social and environmental impact as a whole. As part of this they have donated over 20,000 of their own mattresses to those who need them most, donating one mattress to a homeless shelter for every ten they sell. A mattress not only featured by the likes of The New York Times, Business Insider, Buzzfeed and GQ but also with Michael Phelps on board as a Sleep Ambassador, Leesa is fast becoming a must-have in the bedroom to get those quality z’s. Take a look at the 10,000 five star reviews from satisfied customers if you don’t believe it!